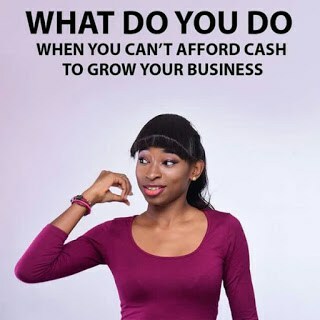 What do you do when you can’t afford cash for your business? “Someone recently asked me for ideas to raise money for something she wants to learn. After a little rant I eventually asked her to spend the whole day on YouTube watching videos of what she wants to learn. The time you did spend waiting , pondering and thinking about people you did ask to help you raise 205k to attend the event management school, you could actually start taking action first. Spend 500Naira, buy 1GB data and go to YouTube (if you learn by watching) and look up every single video on event management….that will even give you an idea of what you actually want to get into. Instead of waiting for the 100k to get into the fashion school first; What actions could you take today? You need a professional camera but until you raise the money to get one. You should go learn how to take better pictures with your Samsung galaxy J7. Imagine 15 years ago, we didn’t even have smartphones or Facebook; Instagram or YouTube. The opportunities we have available to us with technology and the internet didn’t even exist 10 years ago. “What do you do when you can’t afford cash for your business” was written by petfadblog. I stumbled on this on Instagram (@petfadblog) and it resonated with me on so many levels. You should not wait. Stop waiting and giving excuses. You have so many materials within reach. Invest in yourself, use what you have for now and re-strategize with the limited resources you have for now. It is not going to be easy, I tell you but nothing good ever comes so easy. You might be lucky enough to find the push needed to propel you but until then, use what’s available for now to kick-start your journey.